A former VW worker protests outside the automaker's Brazilian factory offices following the release of a study indicating security staff at VW cooperated with the country's former military regime. The banner reads "We do not want to party, we want justice." SAO BERNARDO DO CAMPO, Brazil -- Volkswagen Group has said that a historian commissioned by the company found that some of the security staff at the automaker’s Brazilian unit had cooperated with the country's former military regime. "There is no clear evidence found that the cooperation was institutionalized by the company," said Christopher Kopper, a history professor at Germany's Bielefeld University who carried out the study on Volkswagen's role in Brazil from 1964 to 1985. Kopper based his study on statements made by former employees, documents from Volkswagen's corporate archives in Germany and Brazil as well as Brazilian state archives, Volkswagen said. Cooperation of security guards with the military dictatorship's political police involved listing workers seen as leftist militants and interrogations inside the factory with the use of torture, besides providing cars for detainees to be taken away in, the study found. 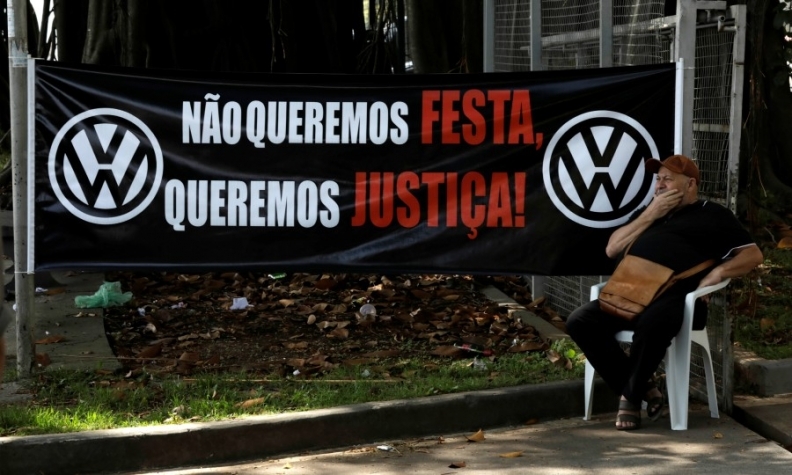 Volkswagen, the third largest automaker in Brazil by sales, said it is not considering financial compensation for the victims at the moment and has no plan to extend the study to its factory in Argentina during the years of military rule there. "We have nothing to hide. We are ready to work with the authorities," Pablo Di Si, CEO of Volkswagen South America and Brazil, told reporters at an event in the Sao Bernardo do Campo, an auto industry hub on the outskirts of Sao Paulo. Kopper told reporters at the same event marking the publication of the study that the company gave him full assistance for an independent investigation. The historian said in his report that he found no evidence of Volkswagen instructing the security personnel to cooperate with the military's secret police but he found that the company's human resources department knew what was happening. He also found that Volkswagen destroyed all relevant historical records once they could be legally disposed of. Outside the factory, a group of demonstrators protested against what they said was Volkswagen's refusal to issue a formal apology and compensate the victims.